Size: 45 cm in length from the beak to the tip of the tail. The Sulpher Crested Cockatoos are primarily white, with black beaks. 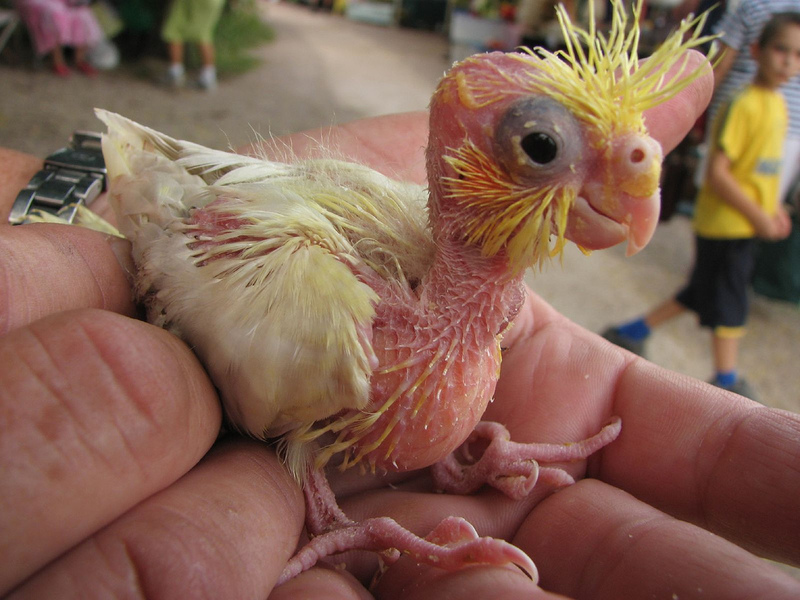 They sport a beautiful crest of yellow feathers on top of their heads, which is the trait that gave them their names! Sulphur Crested Cockatoos have a reputation for being loud and noisy birds, but they are also know to be very sweet and affectionate companions if hand fed as babies. In general, these birds love attention and being handled. Potential owners should make sure that they have the time and ability to provide plenty of attention for their bird before bringing a Sulphur Crested Cockatoo home. For those that can provide for a Cockatoo's needs, the Sulphur Crested Cockatoo makes an exceptional pet that is capable of learning speech, tricks, and a variety of behaviors. 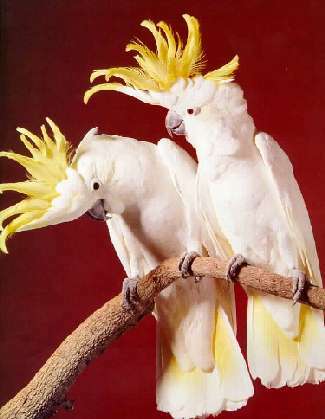 The Sulphur Crested Cockatoo is a highly energetic and lively bird that requires a good deal of exercise to maintain proper health. 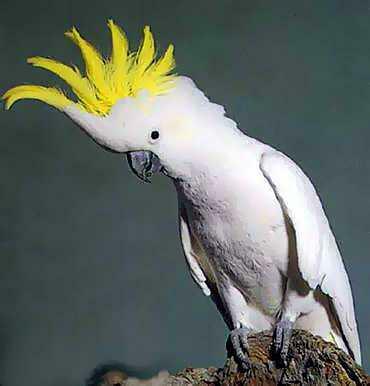 Owners of Sulphur Crested Cockatoos should allow their pets a minimum of 3-4 hours per day outside of their cages. It is also important for owners to provide plenty of space for the bird to climb, stretch, flap its wings, and play. Most Cockatoo owners provide their birds with playstands or special perches that their pets can exercise on. Friendly, quiet, beautiful, gentle, easy to tame. Can be long lived, not a good talker. Aviary breeding rare but possible. 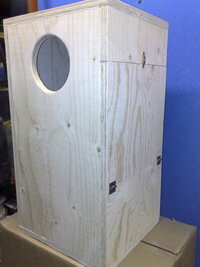 Nest box (or barrel) 50 X 40 X 50cm, entrance diameter 12cm. Lays 1 to 3 white eggs, incubation 25 to 27 days by both parents, fledging 11 to 16 weeks, fed by male for some time after.